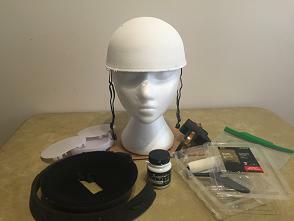 "We just got the basic Adult sized ears- I cut the plastic ears out, measured the glow ear holes, cut out space for the new hat to slide over and cover the Glow hat, and hot glued it all together. " When I checked our in-house ear prospects, none of them were large enough to cover the MWM hat. If you want to pursue this hack, it would be wise to take the ears off the MWM hat and verify it will fit inside the target of your choice before laying down your cash. 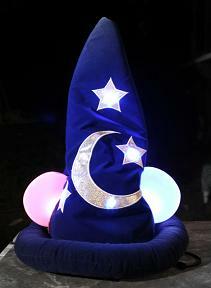 Notes: "I sort of cheated with the sorcerer mickey hat, all I did was take off the fuzzy ears with a seam ripper and pop a glow with show hat inside of it (it actually fits well)"
Conjecture on that page is that these are common holiday hats slit to allow the underlying MWM Ear Hat to poke through. The fabric around the 'ears' looks jagged, as if cut. 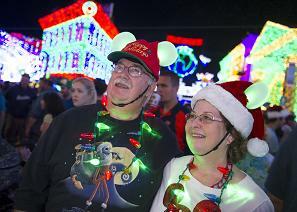 And, the unmistakable chin strap is readily apparent on both people. Another hat over hat hack. 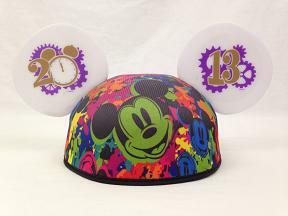 Again, make sure the chosen hat will fit over the MWM hat's dome. There's a cheap Santa hat in our house that works. 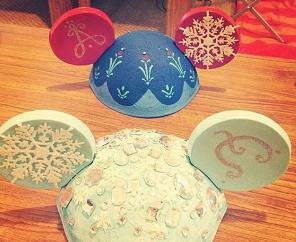 However, all of the Disney Santa hats I tested were too small. Took the ears off a MWM hat and positioned it on my head like I'd normally wear it. Then I pulled a 'slouchy' beanie cap over that and pinned the beanie to the MWM cap underneath. Took the hats off and located the holes where the ears attach and made a small cut in the beanie at that spot. 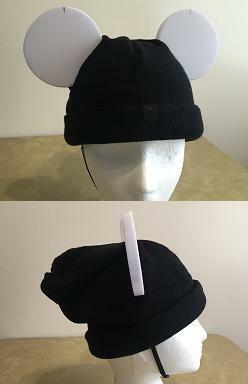 Put the ears back on the MWM hat and put it inside the beanie. Then the size of the cuts was slowly increased just until the beanie could be stretched over the ears. Easy. 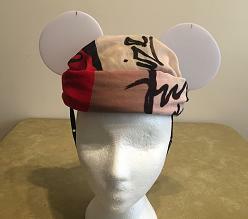 Seal the cut ends and iron a Dopey patch on the beanie and head off to the Mine Train. You'll fit right in. It doesn't get any easier than this. Raid your drawers and find that skull and cross bones bandana from Halloween, or maybe that Harley Davidson one from your last ride. Take it with you when you go to buy the hat. Then tie it over the MWM Ear Hat like a pirate, gypsy, biker would do. Done. That nasty Ear Hat will be pretty much gone from sight. Come Halloween, you can mix it up and wrap the hat with gauze bandages for a mummy or maybe an accident victim look. Took the hat apart and then rolled the dome with 3 coats of Jacquard 220 Super Opaque White fabric paint. The result is a perfectly covered canvas ready for some heavy duty artistic expression. Regular spray paint didn't work. Guess it needs to be paint designed especially for fabric. I skipped the heat treatment to fix the paint. The hat shell looks like some sort of stretch material and I hear they don't do well with heat treatment. Also didn't include the Airfix alternative. There's no intention of throwing this in the wash, so there's a chance that it's good enough as is. To hedge your bets, you might prefer to look into the non-heat alternatives to fix fabric paints - if you don't already know all about them. 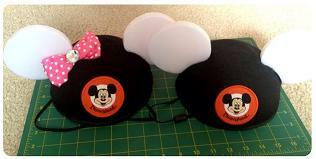 "For this set of custom ears, I kept the original hat and added classic Disneyland-themed cutouts inside the ears. 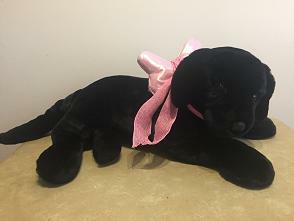 Barely visible when the ears are off, the silhouettes are striking and attention-grabbing when the ears are lit up. Front: Partners statue and Castle silhouette Back: Matterhorn/Tinkerbell and Castle logo ***See video of the ears in action here: https://youtu.be/617WsjFaAbg"
Notes: No details given about the source of the decals, but, from an examination of the hi rez pic on the product page, it's clear those are decals on those ears. They appear to have a Disney logo underneath. Practically any decal could work, as long as the size is right. 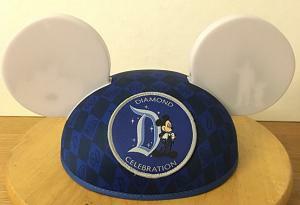 Notes: These particular hats are not MWM hats, but I did see a park attendee with a MWM hat with a similar, if not identical, snowflake item stuck onto their ears. So I took a look online and found a similar treatment to serve as an example. The glitter design would probably work, too. Just need the right stencil. Then there's all the other usual adornments: glitter, rhinestones, pins, decals, plastic items like leaves, flowers, figurines, etc. cloth items, maybe taken from other hats? Some of those additions require heat transfers. I have wondered about the heat sensitivity of the Ear Hat's shell. It's not like the non-MWM hats. It's listed as being polyester on their product site. Over in the UK, they offer personalization via vinyl thermal transfers. So maybe the heat transfer stuff is OK? I'll give it a try and report back. Gluing on may be another option. So far, I've not had great luck with many of the adhesives. Low-temp hot melt glue seems to work OK, but isn't practical for some projects and tends to be messy to work with. If some of you folks know more about all this, please share! Notes: Now that Christmas is over, the MWM Headband's 'bow' has migrated to it's alternate home aboard the guardian of the bedroom. Got another example not on this page? Register and then use the contact link that appears at the bottom of the page for registered users. Help make this a truly useful resource for all MWM lovers!